Tsipoura, N., Mylecraine, K., Ruskin, K. (2008). Ecology of Colonial Wading Birds Foraging in the Meadowlands District: 2008 Final Report. Artigas, F., Pechmann, I., Yang, J. (November 6-8, 2008). Determining Wetland Sediment Chemical Condiditions Using Hypespectral Remote Sensing. 60th Anniversary Meeting of the Atlantic Estuarine Research Society. Fairfax, Virginia. Elefante, D., Marti, A. (April 28-May 2, 2008). Sewer and Stormwater Mapping: A Regional Approach to Municipal Information Sharing. New Jersey Water Environment Association 93rd Annual Conference and Exposition. Atlantic City, New Jersey. Jain, A., Artigas, F., Hobble, C., Pechmann, I. (May 19-21, 2008). Modeling of Sediment Chemistry and Biometric Measurements Based on Remote-Sensor Images. Frontiers in Applied and Computational Mathematics, FACM ’08. New Jersey Institute of Technology, Newark, New Jersey. Konsevick, E. (October 16 -18, 2008). Environmental Geology of the New Jersey Meadowlands District. GANJ XXV Environmental and Engineering Geology of Northeastern New Jersey, Geological Association of New Jersey 2008 Annual Conference and Field Trip. Montclair State University, Montclair, New Jersey. Konsevick, E. (September 12, 2008). Direct to the Web: MERI’s Water Quality Data Management/Data Exchange System. Measuring What Counts for Clean and Plentiful Water, NJWMCC Meeting. Trenton, New Jersey. McClary, M. Jr., Benzecry, A., Bentivegna, C.S. (October 16, 2008). 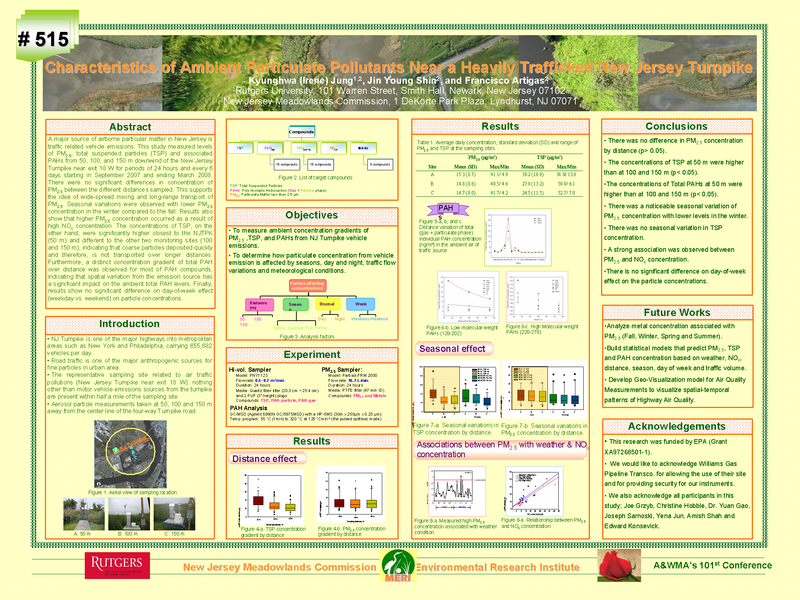 Effects of a Clay Cap on Contaminants in Water, Sediments, Plants and Macroinvertebrates of Kearny Marsh. Third Passaic River Symposium. Montclair State University, Montclair New Jersey. Yadlovski, E., Elefante, D. (April 7-9, 2008). Utilizing Google Earth for Emergency Management. Mid-Atlantic Chapter of URISA’s 14th Regional GIS Conference. Burlington County College, Mount Laurel, New Jersey. Yang, J., Artigas, F., Venugopal, G. (July 3-11, 2008). Characterization of Salt-Marsh Vegetation by Integrating LiDAR and Hyperspectral Remote Sensing. The XXI Congress – The International Society for Photogrammetry and Remote Sensing. Beijing, China.